For starters, IE9 does away with the menu bar and condenses the options into a settings menu at the top right of the window. To further save space, Microsoft merged the address bar with the tabs row. Heavy users can still easily tweak a setting to push tabs back to their own dedicated row. It is also easy to tear tabs out of a window to create a new one or to drop onto an existing IE9 window. The browser fully supports Windows Aero Snap, so you can drag a tab or window to the left or right side of the screen to easily sort two web sites side-by-side. While Internet Explorer 9 does not yet offer an “instant” feature like Chrome, it does offer glimpses at important information without having to load a full webpage. For instance, typing “Weather San Francisco” displays the current bar in a drop down immediately. Appropriately named One Box, the new address bar also doubles as a search field. Although it uses Microsoft Bing by default, it is easy to switch to Google or another search engine. The top result also appears during text input for quick access to the most likely intended web destination. If you are using Windows 7, you probably pin your most commonly used program to the taskbar. 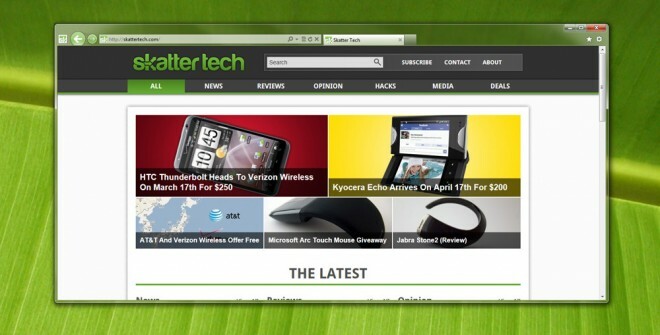 IE9 now makes it possibly to also pin your favorite websites to the taskbar for quick access. While the browser still offers bookmarks, this makes life easy to get to regularly used things such as email. Like Windows 7 optimized programs, websites pinned to the taskbar have a list of quickly accessible tasks. For instance, pinning Hulu offers quick links to head to various sections of the website. The upcoming update for Skatter Tech will add quick access to each of our six hubs. Internet Explorer 9 boasts a safer browsing experience after older versions often became infamous for vulnerabilities. Microsoft brings tracking protection to prevent websites from monitoring your activity. ActiveX filtering limits access to trusted websites only. The browser also isolates frozen tabs without letting it affect other ones. There is a compatibility view for websites that are not yet optimized for the new browser as well. Windows Update even grabs security patches for IE9 regularly. If you are running Windows 7 on your computer, you should most definitely upgrade to Internet Explorer 9. Even if you use other browsers, older versions of the browser have major vulnerabilities. Accidentally clicking a link or visiting a webpage in the wrong browser could have harmful effects. A notice to update will pop up in Windows Update on March 21st, but you can head over to the link below to download and install manually. Don’t forget to mention that IE9 cannot be installed on Windows XP, I’m sure many people are still using that.